Nice weather continues along the Treasure Coast this week. Temperatures have become milder and the water temps are in the mid 70's this week. Winter fishing should prove to be an awesome bite this year. Some of the winter fish have already started to arrive to the area. It can be challenging with the weather, but productive if you use it to your advantage. Look for some windy days ahead and enjoy the fishing this winter! The black drum have been coming in strong and bite has been good for us most days. Nolan had a good day with his dad and they landed 12 drum that were all in the slot size. We ended up with a few sheepshead, one nice triggerfish, a big mackerel and lots of snapper to finish off a good day on the water. All fish were released this week. We lost several good fish that broke us off or threw the hook. Most of our fish have come from channel edges and docks this week. Look for redfish around docks as well this time of year. Snook fishing has been good mostly at night. Pompano will be showing up soon and anglers will be happy about that. The mackerel have been coming in with the tides and been decent sized lately. You can find jacks and ladyfish in many places. There have been whiting in the surf this week. Perfect for the kids! As winter sets in and we get the weekly cold fronts, make sure you are changing your fishing habits to fit the conditions. Water temperature will help show you where you might fish. A couple degrees in temperature can mean the difference having a successful day. Wintertime fishing is very good in our area, but you must watch the conditions and plan your fishing carefully. The black drum bite is getting better and better each day. 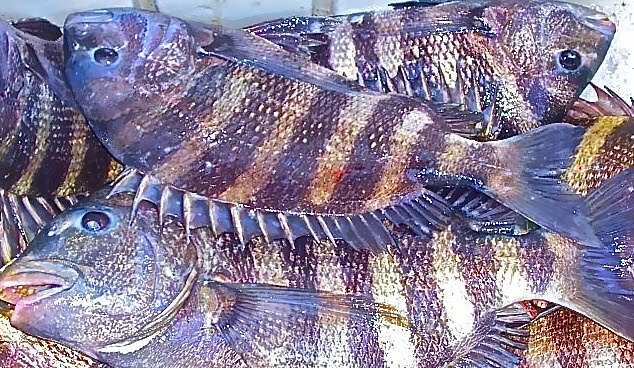 Good number of sheepshead are here too. A couple of smaller trout came from Bear Point yesterday. A few flounder came from the jetty. Redfish and snook were in the Inlet yesterday. Also, snook around the North Bridge and in the Turning Basin - fish the last hour of the out going and first hour of the incoming tide for your best results. FLOUNDER, SNOOK AND REDFISH…GET OUT THERE! A hearty congratulations to our out-of-town angler featured this week, Dennis Adams from Cincinnati, Ohio! He caught this 31’ ¾” slot Snook on live jumbo shrimp . 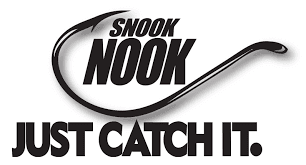 Its time for everyone to circle December 15 on your calendar and make sure you head to The Snook Nook for their Annual Tent Sale and Customer Appreciation Day. 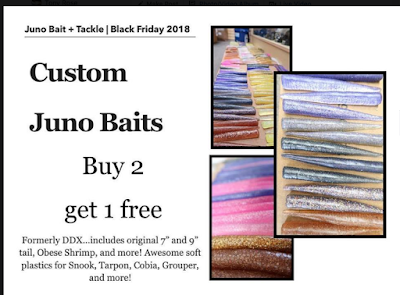 Fred Caimotto, owner of the Snook Nook, told me the deals are never going to get better on every item in the store and there will be thousands of dollars in raffle prizes during the course of the day. 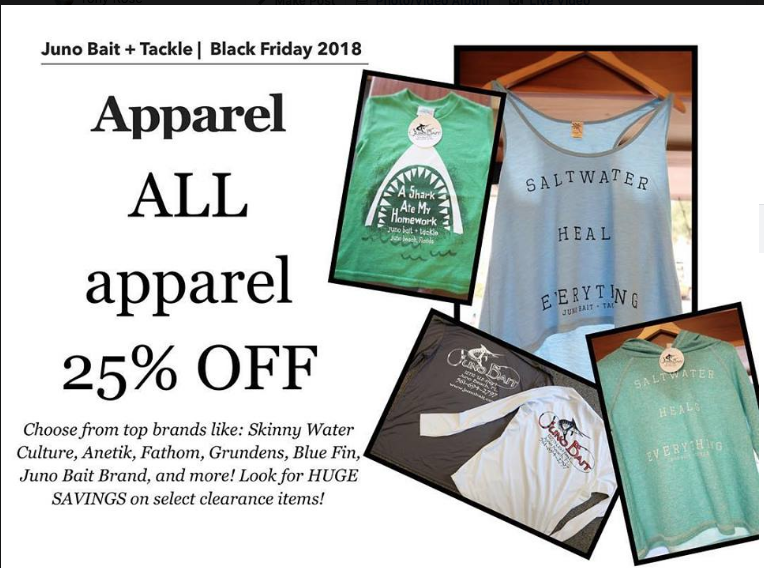 I will be there all day if anyone has any questions about our local surf fishing and some of the best captains that fish the river, inshore, and offshore are all participating. 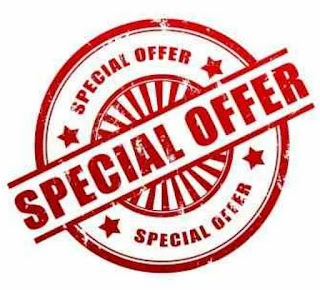 Gary Zeidman and son Nick from Penn will be in attendance also and the deals on Penn products are going to be incredible. 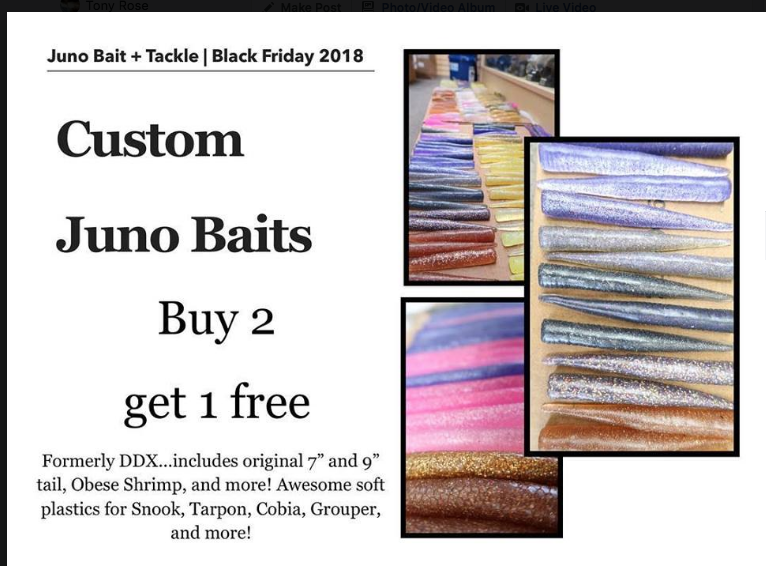 Those of you that missed the Fishbites Buy 2 Bags and get one free promotion at Bass Pro in October are in luck as Billy Carr and Brett Burford from Fishbites, are also going to be on site and will be conducting the same program all day at the event. 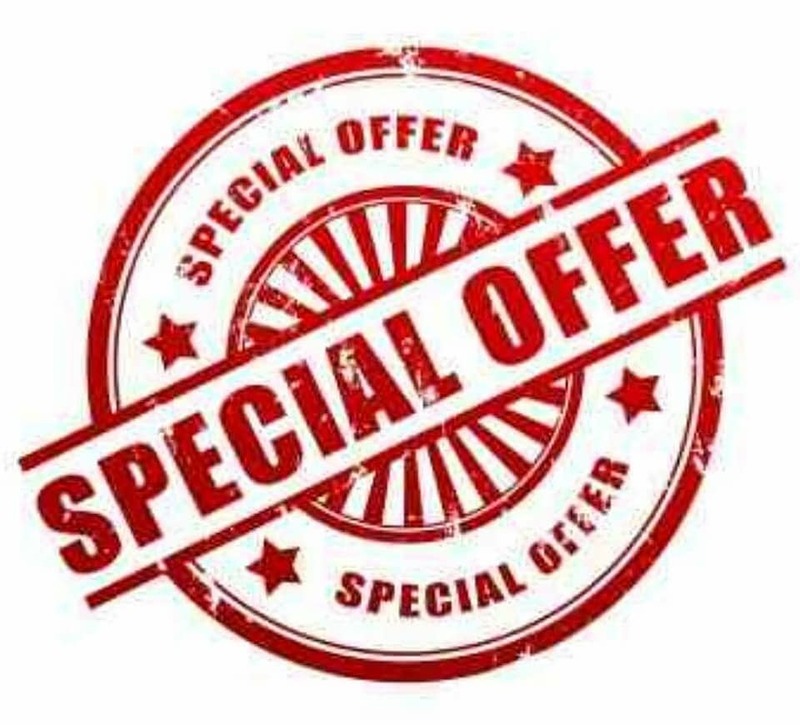 Get there early to take advantage of all of the deals that will be available. Hope to see you there. Its early Monday morning and looking at this mornings weather report it looks like the surf is laying down to a point where its going to be fishable today. The big swell that has been with us the past few days is diminishing if you have the chance to wet a line today get out and try it. Middle Cove Beach access looked like an interchange on the Turnpike yesterday morning with cars and trucks pulling in and out with anglers hoping to bend a rod and then going over the dune line and finding out the big waves were still with us. The next front is forecast to move our way late Tuesday into Wednesday with Northwest and North winds up to 25 knots on Wednesday. The late part of the week looks good with North/Northeast/and Easterly winds of only 5 to 10 knots. We should be seeing more schools of pompano, bluefish, and mackerel making their way down the coast with each passing front. I am fishing today and Wednesday and hopefully will be able to post some positive reports during the week . Good luck and catch em up. It's nice to report that pompano, whiting, bluefish, and mackerel are being caught at a lot of locations. The last few days have produced keeper pompano from Round Island in Fort Pierce to the North, to Tiger Shores at the south end of Hutchinson Island. Big whiting are also being caught by fisherman targeting the pompano. My son Randy fished at Tiger Shores this morning and caught some nice pompano along with 14 big whiting. Orange Clam and EZ Flea Fishbites produced the bites. I fished one day earlier in the week and was catching pompano on one hook and foul-hooking Spanish mackerel when I was reeling in. 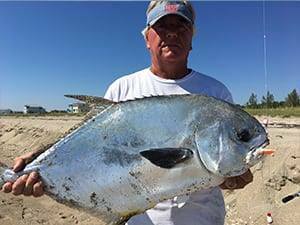 My pompano were undersized and these bigger fish finally showed on Tuesday. Casting spoons early in the morning should bend some rods with the bluefish, mackerel, and jacks as these schools have been up and down the entire area. Things are heating up along the beaches so it's time to start putting some nice pompano in the cooler. Good luck this holiday weekend and catch em up. 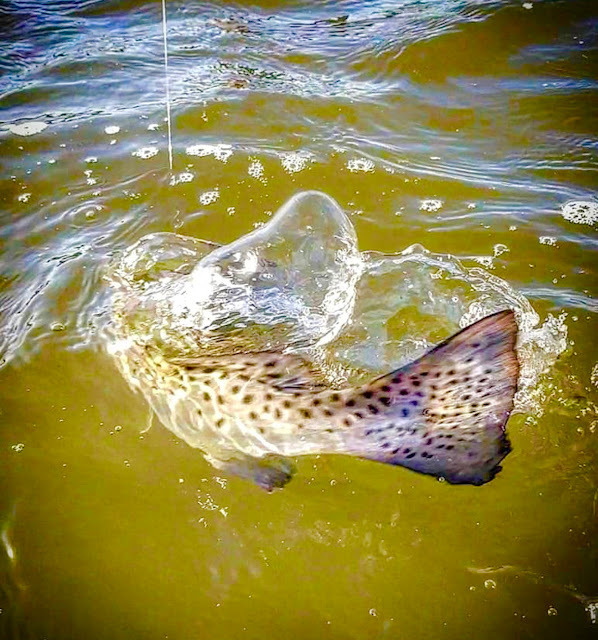 With the cooler temps, fishing in the Indian River has really been good for redfish, snook, and trout. Redfish are still around shorelines with clear water, and have fallen for plenty of artificials, especially DOA Shrimp and CAL shad tail jigs. Snook have been tight to the mangroves, but plenty of them are being caught on plugs such as Mirrodines and Yo-Zuri 3D Inshore Twitchbaits. Trout catches have been increasing, with fish being caught on a variety of jigs and plugs in 3 to 4 feet of water. On the beach, plenty of Spanish are being caught in The Cove area on spoons and jigs, with bluefish falling for the same and the occasional topwater plug. The water in the inlets has been really clear. 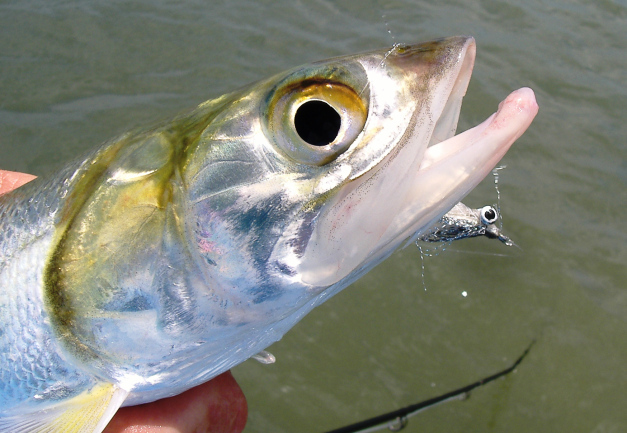 making live mullet or croakers the best bet for snook, but there are still some falling for flare jigs and plugs. Live shrimp in the tank today. The inshore fishing was good over the weekend for black drum, sheepshead, snapper and snook. 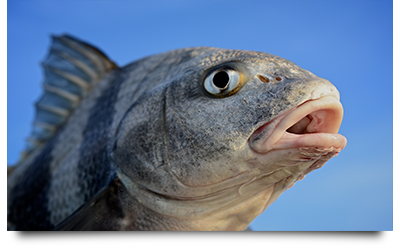 Fish around any structure for the black drum, snapper and sheepshead and use a small live shrimp. The snook were around the North Bridge, in the Turning Basin and in the Inlet. In the surf there was whiting and a few short pompano. Inshore fishing remains a bit tough; as we are out of summer time patterns, but not yet into the true winter swing of things. Snook fishing has remained good, but it's a time investment for sure right now. It's swinging into true flair hawk/jig season for the snook, and the tide has to be right for them. If it's not the tide window they like...they just aren't going to want to bite. The tricky part comes in figuring out which tide it is that they will bite on. Could be incoming (first or last) or outgoing...and it varies by spot; hence the time investment! Gotta keep going and keep casting to figure it out. The flats around Hobe Sound (Mile Marker 40) continue to produce a nice mix of species, and remain one of your better bets around on the inshore side of things. The weather has been fantastic this past week. Temperatures in the mid eighties and winds that are very cooperative to fishing inshore. Water temps in the mid to high seventies have really improved the fishing around the area. ;Expect similar conditions in the near future as winter establishes itself on the Treasure Coast. It has been another exciting week on the water. We have enjoyed a good variety of fish this week. Snapper have been the most prevalent fish out there. 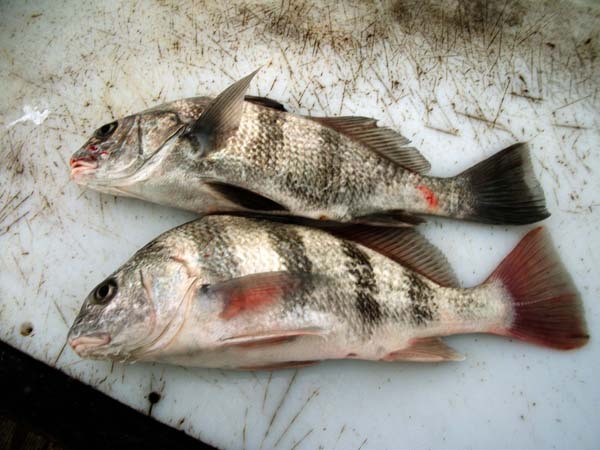 Sheepshead and drum are moving into the river now and that is good news. Pompano and mackerel are also coming into the river. Winter fishing is always productive and exciting for anglers! Snook have been good at night around the jetties and bridges. Snapper are everywhere and some decent sizes to them. Redfish have been under docks along with drum and sheepshead. Fishing will continue to improve as the water temperatures fall and more of the winter fish arrive to the area. It should be a great November and December this year! "Capt. Paul" is a transplanted inshore and offshore fisherman from New Jersey. He relocated to Port St Lucie five years ago after having vacationed in that area for over 25 years. 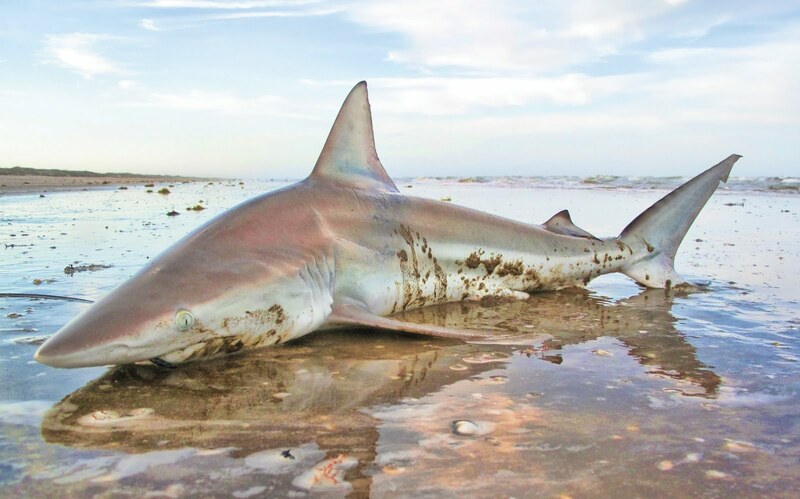 His northern pursuit of sea bass, fluke, bluefish, and striped bass on the inshore scene to yellowfin tuna, bluefin tuna, mako and thresher sharks in the northern canyons was replaced by targeting the fantastic surf fishing opportunities that are available along the Treasure Coast. 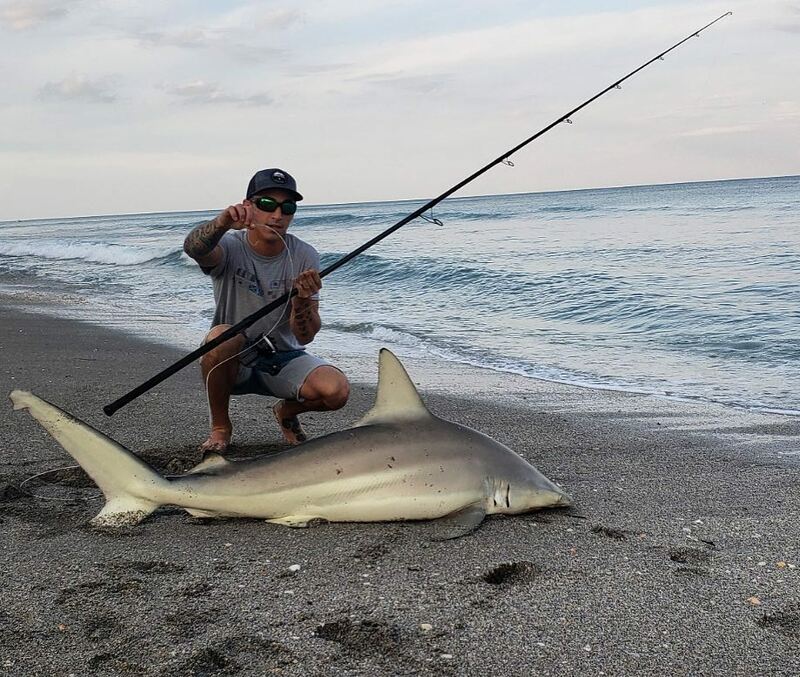 Permit, pompano, whiting, croaker, snook, tarpon, Spanish mackerel, bluefish, and jack crevalle are just some of the species that he personally targets and guides his surf fishing charters to along this stretch of southeast Florida. 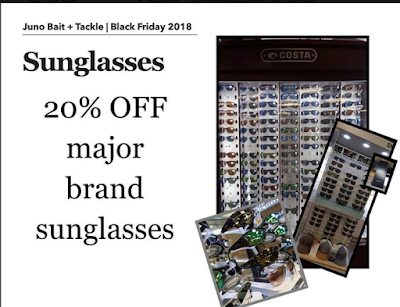 A Bass Pro Shop associate, Paul is also a member of the Penn Pro Staff and affiliated with the area’s biggest bait and tackle shop on Hutchinson Island - the Snook Nook in Jensen Beach. He conducts How-To Seminars at Bass Pro Shops on a regular schedule. Capt. Paul also conducts other off-site seminars for civic groups and fishing clubs from Fort Pierce to West Palm Beach. 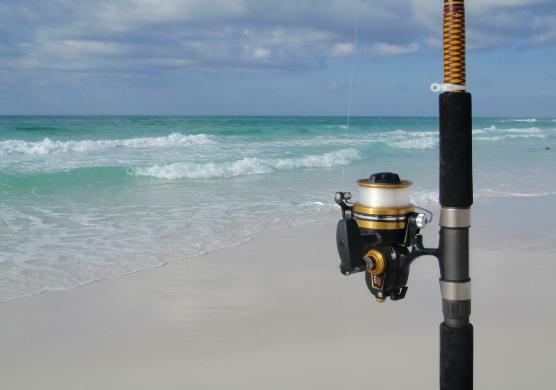 You can hear Paul's South Florida Surf Fishing Report on Saturday morning on 94.3/WZZR. As far as print and online, you can read his Surf Fishing Reports on a regular basis in all of the TC Palm publications, Stuart News, St. Lucie News, St. Lucie Tribune, Indian River Press, and on TCPalm.com, in the fishing report columns that are headed by the widely known and respected outdoor sports writer, Ed Killer. 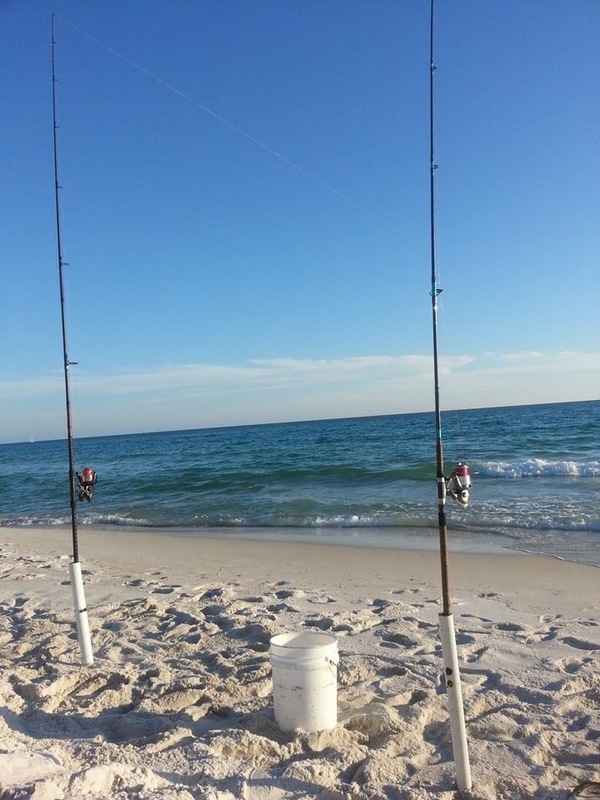 Paul spends an average of four to five days a week on the beach along the Treasure Coast guiding and personally fishing for the multitude of fish that are available along this great section of the Florida coast. One of the best aspects of surf fishing is that it is the perfect sport for everyone from children to grandparents." Anyone can do it and it’s as much fun watching my grandson and granddaughters reel in a 12-inch whiting as it is watching a charter customer land his first pompano or snook", says Paul. 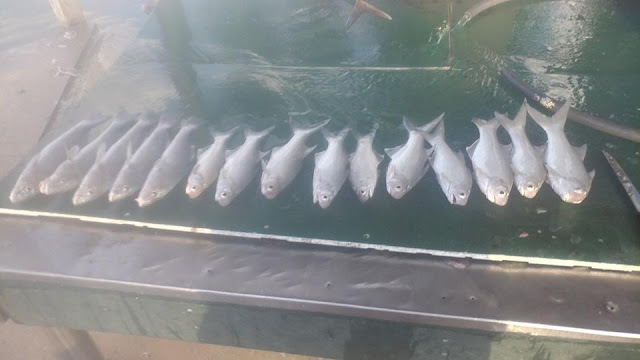 After the rain stopped yesterday the black drum and sheepshead bite continued to be good around any structure you could fish. Some of the drum were on the smaller side and were released. The snook are still in the Turning Basin and in the Ft. Pierce Inlet. For your best results fish the hour before until the hour after the tide changes and make sure your live bait is on the bottom. Some reds in the Inlet. The catch rate from our local beaches this past weekend certainly left something to be desired on both Saturday and Sunday. Conditions on Saturday were pretty darn good without alot of wind or big surf but unfortunately that memo never made it to the fish. 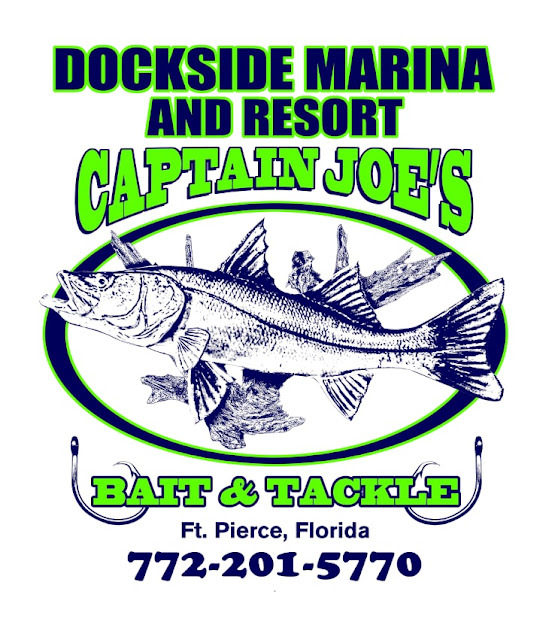 Spotty reports of a few croaker, whiting, jacks, mackerel, and bluefish were spread out from Fort Pierce to Hobe Sound. The pompano were also pretty tough to come by and those anglers targeting that species are looking forward to a decent front to move down our coast and hopefully push a new body of fish into the area. I fished at Stuart Beach on Saturday and the only bites I had were from some small jacks and a palometa. The folks I spoke with at that location who were fishing the first trough did manage to put a few whiting and croaker in their coolers. Pink Shrimp and Orange Clam Fishbites along with some cut shrimp produced those fish. I fished near Fort Pierce Inlet on Sunday and caught jacks and blue runners. Schools of mackerel were thick up that way but did stay out of casting range. This week looks like we might have some decent sized surf to contend with and most of the forecasters are talking about a front for next weekend. Hopefully this weather will trigger some good activity in our area and we will get this late fall run back on track. Good luck and catch em up. Inshore the trout bite has been good to the south around Bear point to the power plant on the out going tide. The snook bite at night has been slow around the bridges and in the inlet but should pick up with the front at the end of the week. 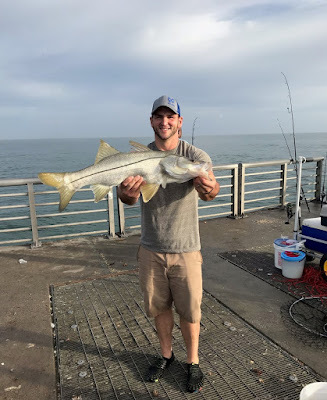 INSHORE- A bit slower inshore this week, but still a good number of snook catches coming in. Look for the bridges to produce well at night, especially on outgoing tide. 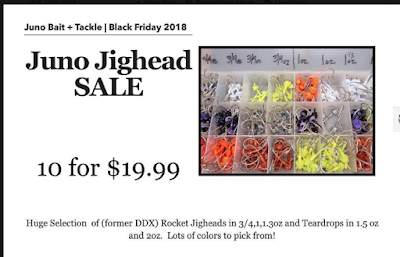 With the mullet thinning out inshore; it's time to start concentrating on the jig bite again. Seawalls and boat docks will also be a good choice for the snook. The Hobe Sound flats continue to produce a nice mixed bag assortment of species, especially early in the morning and then again later in the afternoon. SURF/PIER- Surf fishing remains very good over the past week. 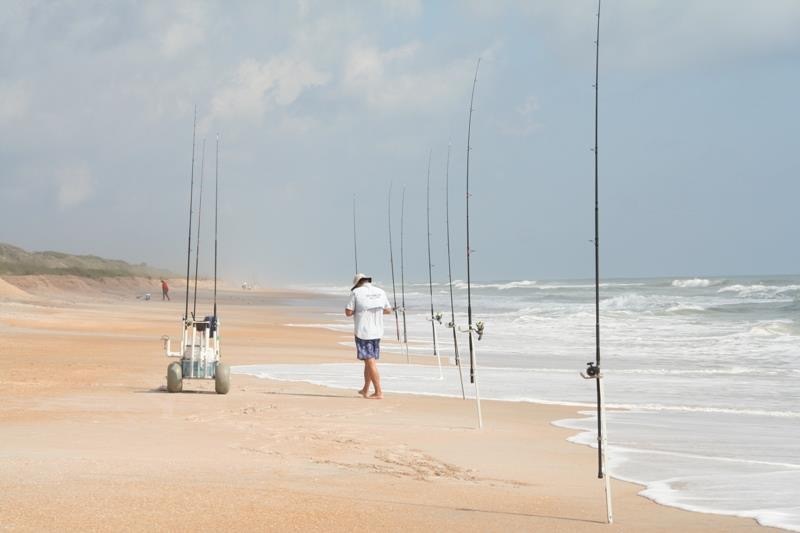 Bluefish, jacks, ladyfish, and some big Spanish Mackerel have been scattered up and down the beach in good numbers. Low light periods are best for the most action; especially for those hoping to use lures. Large topwater poppers, longcast swimming plugs, and diamond jigs/spoons have been the best lure choices. Still some pods of mullet along the beach with tarpon and blacktip sharks hanging around them. The snook have largely peeled off the beach, but you may still find a few around the lingering mullet schools. Pompano bite remains very good for those putting the time in. Still a fair amount of smaller pomps around, but it does sound like the number of keepers being caught is improving. Sandfleas, clams, and Fishbites will be the top producers bait wise for sure. catch the blues and mackerel for over an hour in the rain yesterday morning. Bait, birds, and white water could be seen up and down the entire beach area. High tide times will be in the morning this weekend so get out and take advantage of some late fall surf action. Good luck and catch em up. Surf Fishing SECRET REVEALED! CATCHING MORE POMPANO by doing this! With the massive mullet run underway, the tarpon are also out in force and enjoying the pretty much all-they-can-eat buffet. They are blowing up schools at the bridges, along the docks and on the flats. 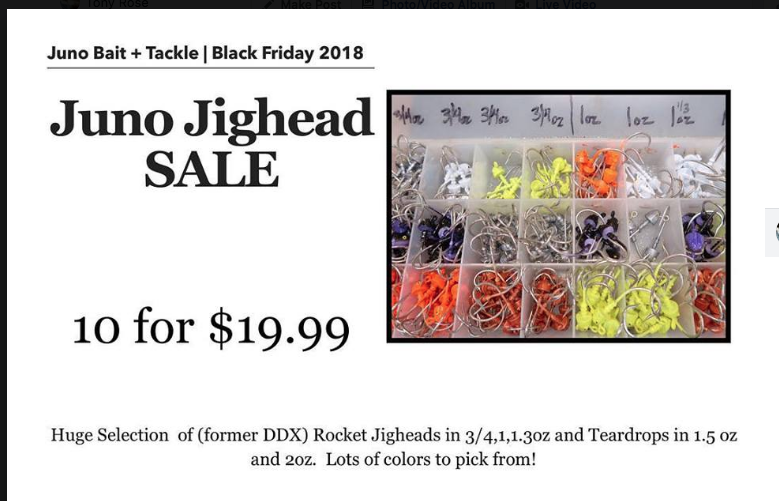 For anglers looking to hook up with one of these hard fighters, D.O.A. TerrorEyez and D.O.A. Baitbusters in mullet patterns are working well. If going with live bait, use a mullet that is significantly bigger than the ones in the schools you’re targeting so it stands out. Though the snook bite has cooled off a bit, they, along with jack crevalle, are also enjoying the mullet run and being caught along the area seawalls. Along the Stuart and Jensen Causeways, there have been a few black drum caught. 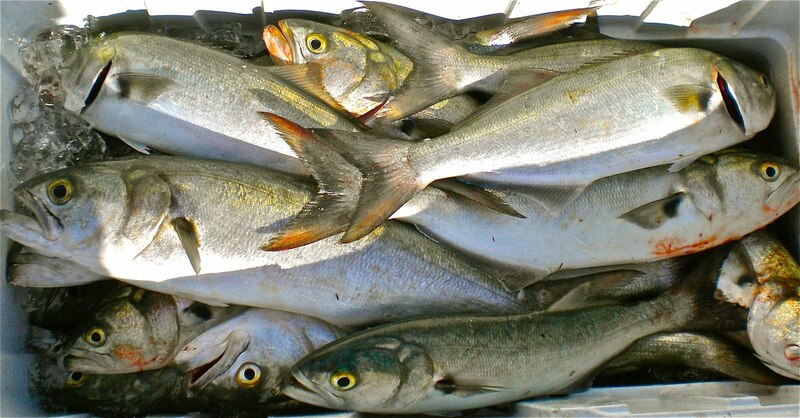 Good-sized schools of mullet are moving along the beaches in Jupiter and the tarpon there are putting on quite the show. Fish up to six feet long are absolutely hammering them and jumping clear of the water in the process. Anglers working the mullet schools are catching tarpon, snook and jack crevalle. If targeting snook, plastic grubs and Rapala X-Raps in the six- to seven-inch range are working well. Inside the inlet near Dubois Park, the minnows are still thick and there are blue runners, snook and tarpon. 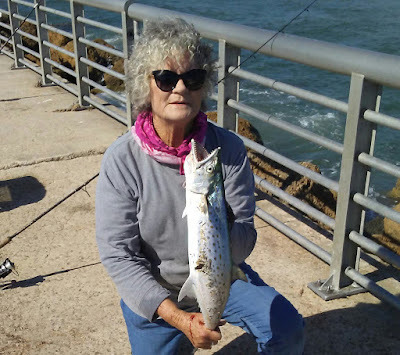 With mullet running through the area, anglers fishing around the Boynton Inlet have been catching bluefish and Spanish mackerel casting spoons, jigs and GOT-CHA lures early in the morning. Snook, mutton snapper, jacks and a few redfish were being caught by anglers fishing live and cut bait on Monday off the north jetty. In the Boynton Beach area, the Intracoastal Waterway has been on fire recently. Casting plugs around the mullet schools has been producing strikes from snook, jack crevalle, bluefish and the occasional redfish early in the morning. Fishing live and cut bait around the channel edges, rock piles and channel markers has been producing catches of tarpon, cubera snapper, bluefish, ladyfish and redfish. Best bet is casting quarter- to half-ounce Cotee jigs with gold glitter grub tails under and around the boat docks and rocky shorelines for redfish, snook, tarpon, ladyfish and jacks around Manalapan and Hypoluxo Island. 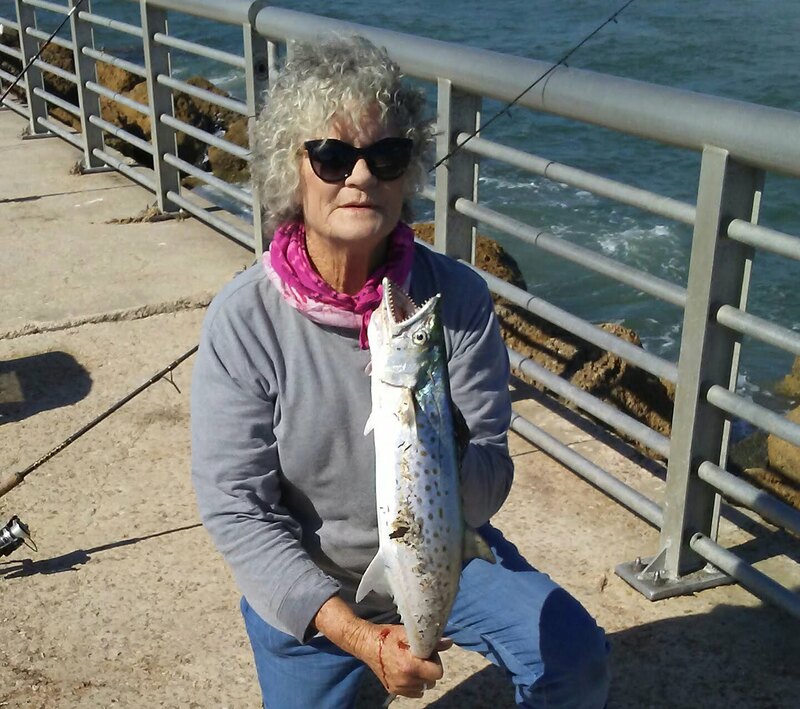 Lantana bridge anglers have been catching bluefish on live and fresh-cut mullet fished on the bottom. 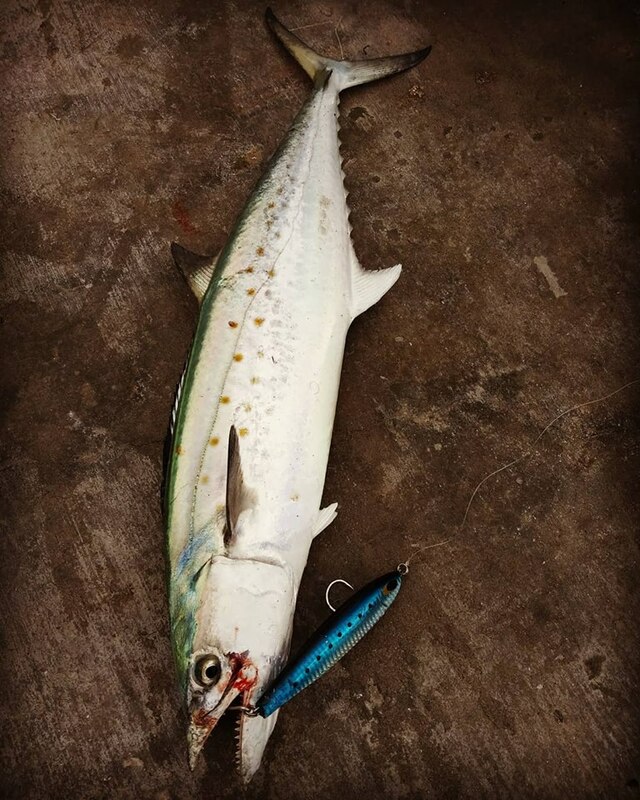 Spanish mackerel were hitting live shrimp and yellow jigs early Tuesday morning. There are reports of tarpon, ladyfish, snook, and jacks hitting at night by anglers using live bait and also on shallow diving lures. Though it’s been a bit windy, the bass bite is still excellent. In the early mornings, anglers working the grass lines are having good luck with live shiners and with artificial worms and crank baits. As the day progresses, however, live shiners are the way to go. 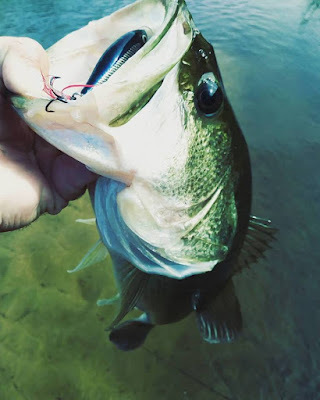 The bass bite in J&S Canal and Henry Creek areas has started picking up. The bluegill bite is still solid in the canals and the Kissimmee River. 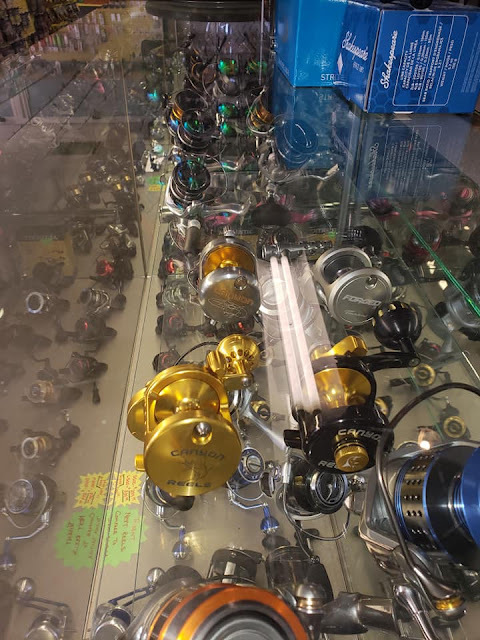 Inshore the snook bite has been hit or miss around the bridges with live bait and jigs we just got restocked with our First Light jigs so stop on in and get the colors you need. The trout bite has been decent to the north around Vero with a few reds mixed in on the outgoing tide. The snapper bite has been good around the channel edges with live shrimp on the incoming tide. The weather looks like it will be great the next few days hopefully you can get out. Fish are here, red tide has been gone, and it’s time to get out there and drop a line! Sarah at Sebastian Inlet Bait & Tackle is back, and she’s been seeing a pretty good run of Spanish Mackerel biting on Got-cha lures. Jacks and Blues also in the mix. Slot Redfish at the morning tide change have been great and they are biting on live shrimp or topwater lures. A Snook here and there, not too much. 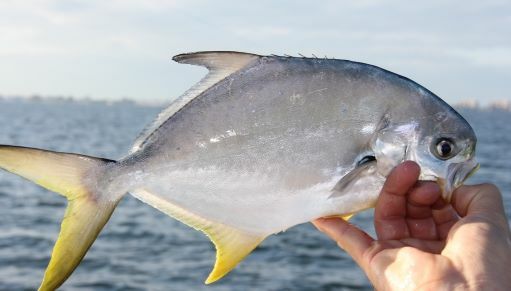 Black Drums are starting to show up, head to the tip of the North Jetty and try fishing from the beach for Pompano. Sarah knows here stuff, go see her for the latest! A very special thank you to our featured angler this week, Allan Noel, a regular at Sebastian Inlet. Three weeks ago, he landed this beautiful 43-inch Redfish off the North Jetty. “Saw mostly Redfish and Jacks coming over the rails and one nice Cubera Snapper.” Thanks Allan for sending in your pic! 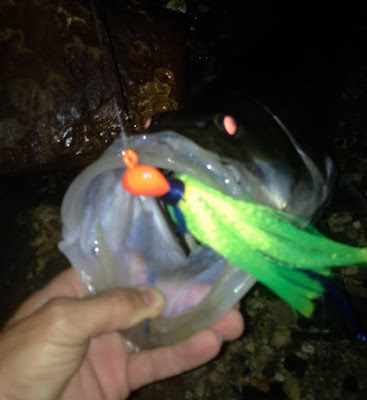 #1: Topwater Plug – Great for when Redfish are active, early morning and late evening. #2: Scented Soft Plastic – Redfish depend heavily on scent when feeding. Especially effective in dirty water to help land one. #3: Gold Spoon – “A timeless classic”, throwing a gold spoon is good anytime. #5: Popping Cork and Soft Plastic – Attention getting for sure and the soft plastic of your choice makes for an easy meal. The past few days have produced a lot of different species available for the taking along all of our beaches. 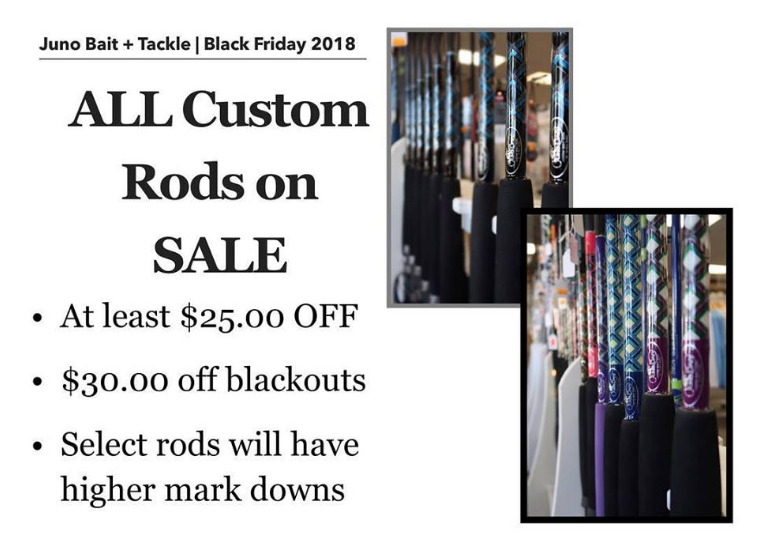 From Fort Pierce to Juno Beach, pompano, whiting, croaker, bluefish, jacks, spanish mackerel, permit, and ladyfish have consistently made the catch list - so your chances of bending a rod are pretty good. Sunday and Monday were hampered by wind and weeds but that situation is only temporary. The nice part of this report is there is no mention of red tide as that condition has left the area. I heard from Mike and Tonya Shulze on Friday and they had a nice catch of pompano and whiting from Middle Cove Beach. Chris Battjer from Palm City sent me a picture of a beautiful limit catch of pompano he took from Stuart Beach on the same day. 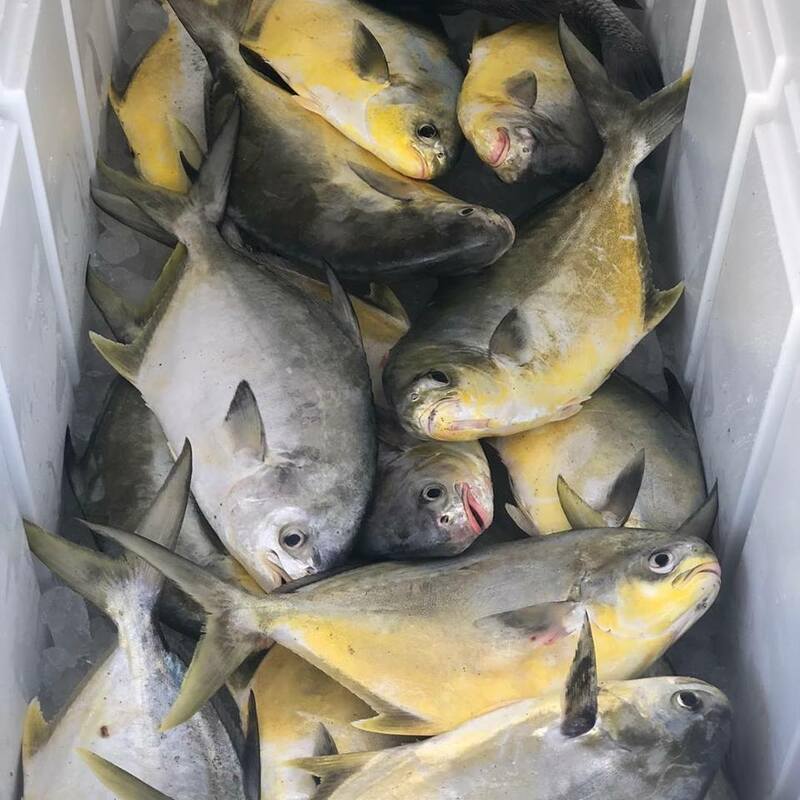 I fished on Saturday and Sunday and put pompano and whiting in the cooler along with releasing some bluefish, jacks, croaker, and ladyfish. The excitement of the weekend for me was hooking another big permit at Middle Cove and fighting him for about 15 minutes before finding a snag and breaking me off. Bridge Road beach access in Hobe Sound and Middle Cove were the two areas that I fished. 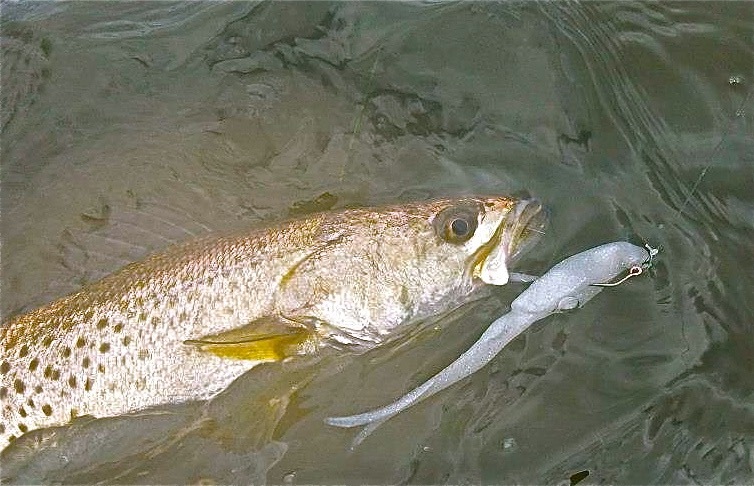 The same baits, EZ Flea and Orange Clam Fishbites, continue to produce the majority of the strikes along with live sandfleas that have been thick along the northern beaches of Hutchinson Island. I got a call from a friend yesterday relaying that schools of mackerel and bluefish have shown up in big numbers from Juno Beach to the South end of Hobe Sound. This is a nice spread of fish. Lighter winds are forecast for the upcoming week and with a gradual cool down of the water temperature, more of the late Fall and Winter species should be migrating down the beach. Good luck and catch em up. After a few weeks of dealing with Red Tide, Indian River County beaches have opened this morning, with the exception of Tracking Station, where cleanup is ongoing. The ocean looks nice and clean, and there are still mullet migrating south, and even some glass minnows and greenies around. 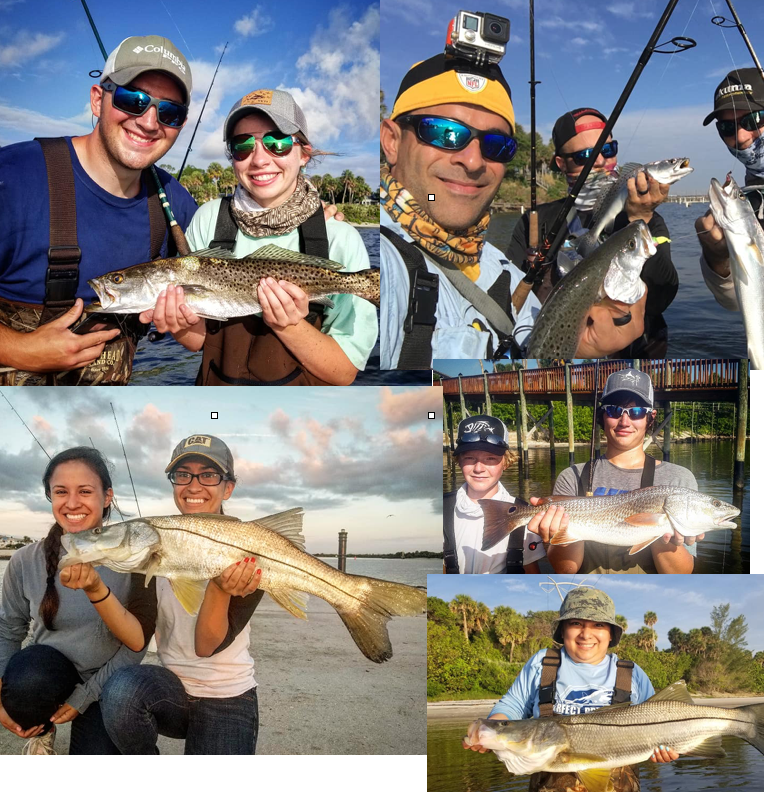 The IRL has been fishing very well of late, with lots of bait around and plenty of reds on shorelines, as well as snook and even some baby tarpon around docks and canals. Water clarity varies, but if you look around sight fishable water is available.